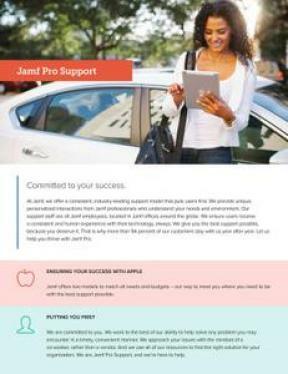 At Jamf, we offer a consistent, industry-leading support model that puts users first. We provide unique, personalized interactions from Jamf professionals who understand your needs and environment. Our support staff are all Jamf employees, located in Jamf offices around the globe. We ensure users receive a consistent and human experience with their technology, always. We give you the best support possible, because you deserve it. That is why more than 93 percent of our customers stay with us year after year. Let us help you thrive with Jamf Pro.